Where Are Those Precious Mistakes? Contact sheets (and yes, I do include digital photos whenever I mention these almost relics of the past) really are our closest parallel to what a sketchbook would be for a painter. I sketch out ideas for images, write notes, and journal as much as I can, but to see those frames before and after the final image, one that the viewer is already familiar with, is pretty magical. 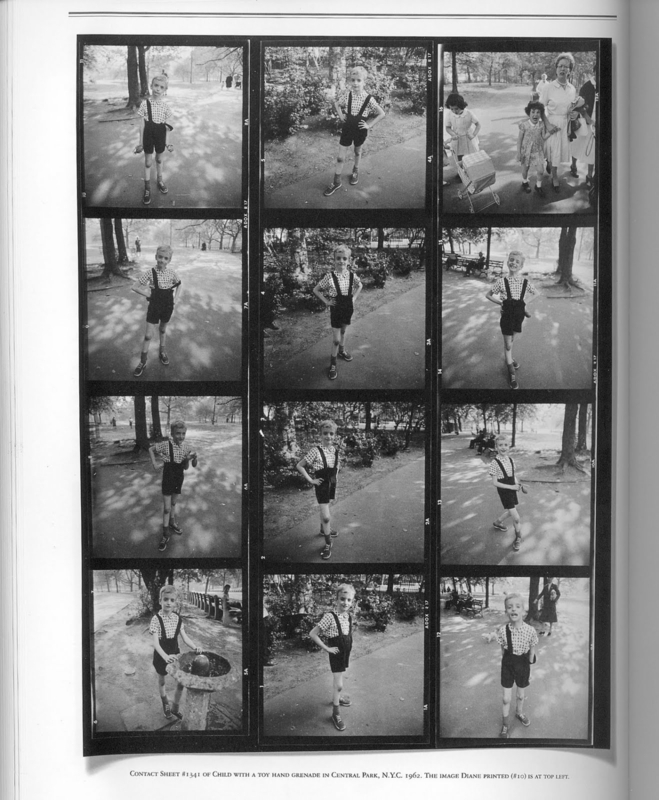 I remember seeing Diane Arbus’ contact sheet for “Child with Toy Hand Grenade in Central Park” back in college – which could be argued is one of the more famous contact sheets out there, shown in countless Intro to Photography classes – and being fascinated at finally being able to get a glimpse into the process of someone of her stature. On this single sheet of photographic paper, you see how she first encounters the boy. He’s a bit rigid, probably from having a stranger come over and ask to make pictures of you. He seems like he holds the same statuesque pose, smiles a little bit, then takes a drink from the fountain. Suddenly, like an actor realizing the cameras are rolling, the boy slips out of his left overall suspender, and as if the director has finally called “action!”, he springs onto the stage with confidence and stride. Only a couple of frames over, she happens upon it: the iconic image we all know of the child holding the toy grenade. He stands in an almost cartoonish exasperation, suspender floating over his arm, head slightly tilted, and a hand gripping the air as if it stole his heart. A moment later, with a beaming smile and hands on his hips, he gives Arbus his last pose. Just as quickly as he appeared in the first frame, he vanishes into the midsummer day. Of course, so much of what I just wrote is conjecture. Contact sheets don’t make photographs any more “real”, but they do give us this wondrous look into a practice that is often solitary. And even for those of us who are familiar with this process, I can’t deny how much I would love to see contact sheets from everyone. Unfortunately, people seldom share these. And really, I get why. Photography really is so much more about the editing process: picking the more successful image in a sea of less-than-so options, finding the flow from one picture to the next, doing whatever is necessary to make that image shine. In a medium that already has this palpably tenuous relationship between what is “good image” or “failed” one, exposing our venture to that final image and what came after can feel as though you stand naked in front of the crowd. Will you see how many bad ones I make? The myriad of mishaps that are bound to happen? Does too much context effectively ruining the effect of mystery and surrealism that makes photography so powerful? Is there a worry of eroding the almost mystic quality surrounding the artist who can produce one great image after another? Or there’s also the case of me possibly being overly romantic about all of this. If you have an answer, please let me know; I really just want to see more mistakes out in the world.